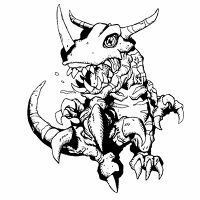 A Dinosaur Digimon whose cranial skin has hardened so that it is covered in a rhinoceros beetle-like shell. 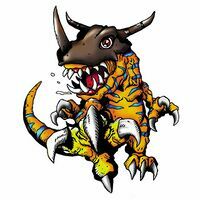 It is an extremely aggressive Digimon, with a body like a lethal weapon covered in sharp claws and gigantic horns. However, it is highly intelligent, and if you're able to tame it then there probably isn't any monster as strong. 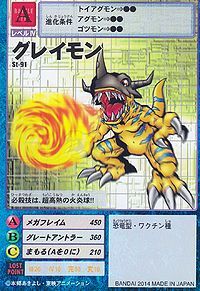 Its Special Move "Mega Flame" is spewing extremely high-temperature flames from its mouth and reducing everything to ashes. A Dinosaur Digimon whose cranial skin has hardened so that it is covered in a rhinoceros beetle-like shell. 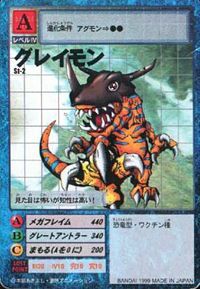 It is an extremely aggressive Digimon, with a body like a lethal weapon covered in sharp claws and gigantic horns. However, it is highly intelligent, and if you're able to tame it then there probably isn't any monster as strong. The Greymon that inhabit the Folder Continent don't have frenzied personalities, and because of their great intellect they are able to use fighting styles that rely on cooperation with their comrades. 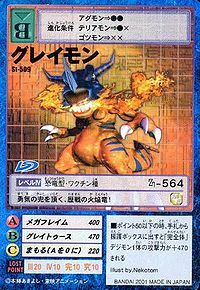 Its Special Move "Mega Flame" is spewing extremely high-temperature flames from its mouth and reducing everything to ashes. A Dinosaur Digimon whose cranial skin has hardened so that it is covered in a rhinoceros beetle-like shell. It is an extremely aggressive monster, with a rough disposition and a body like a lethal weapon covered in sharp claws and gigantic horns. However, it is highly intelligent, and if you're able to tame it then there probably isn't any monster as tough. 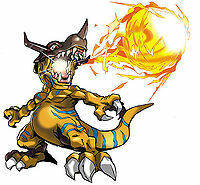 Its Special Move is the flame shot "Mega Flame" its spews from its mouth to reduce everything to ashes. 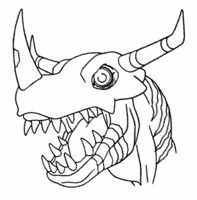 A Dinosaur Digimon whose cranial skin has stiffened and become helmet-like. With its body like a lethal weapon, its sharp claws tear through everything!! 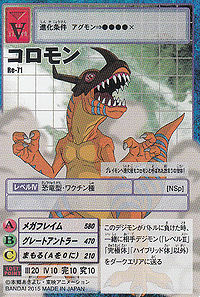 As for why a Dinosaur Digimon is in the Metal Empire, it seems to still be a mystery. It has a great intellect for its appearance, and its specialty is coordinated attacks with its comrades. "Mega Flame", which burns everything to cinders, is its Special Move!! 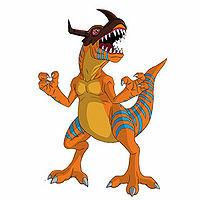 Agumon's Adult level evolved form. A Dinosaur Digimon whose cranial skin has hardened so that it is covered in a rhinoceros beetle-like shell. 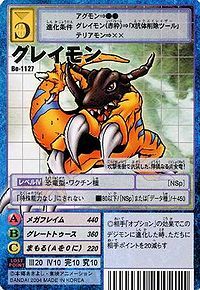 It is an extremely aggressive Digimon, with a body like a lethal weapon covered in sharp claws and gigantic horns. However, it is highly intelligent, and if you're able to tame it then there probably isn't any monster as strong. adj., From corruption of alternate transcription of Great 「グレイト Gureito」 in Japanese. Mega Flame  メガフレイム Mega Fureimu Digi Nova Blast/Nova Blast/Nova Flame/Mega Flame/Fiery Breath Fires a gigantic ball of flame from its mouth at the opponent. Great Antler  グレートアントラー Gurēto Antorā Great Horn Attack/Great Antler Headbutts the enemy with its powerful horns. Hits the opponent with its tail. Slams its tail into the opponent. Great Horn  グレートホーン Hōn Supairaru Great Horn Bash Shoots forward horns-first. Spits fireballs from its mouth. Creates a wall of fire to stop enemy attacks. 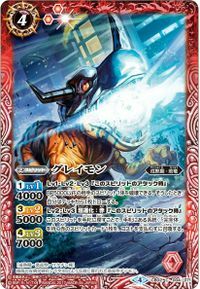 Great Horn Attack  グレートホーンアタック Gurēto Hōn Atakku Great Antler Bash Stabs upwards with its horns. Charges the opponent and attacks multiple times with its horns. Attacks with its burning horn. An Agumon, that Taichi and Hikari had encountered, battles a Parrotmon. During the fight it evolves into a Greymon. At first Parrotmon knocks it out but Taichi blows Hikari's whistle (after Hikari ran out of breath) waking it up. 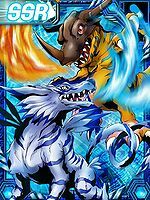 Greymon and Parrotmon then kill one another. After falling off a cliff in the previous episode, the Chosen Children arrive on a beach. There, they find a row of telephone booths. After trying to use them (and failing miserably) the Chosen Children decide to have a break and eat some food. While six of the kids and their Digimon are discussing the eating arrangements, Taichi and Agumon decide to eat "a little something," rather than wait for the others. Agumon calls out the word 'EVOLVE' and begins to glow himself. 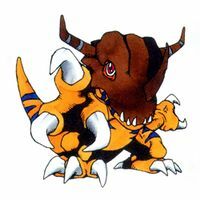 Agumon evolves to Greymon and flips Shellmon. After knocking it over, Greymon uses the technique Mega Flame to send Shellmon flying far off into the ocean. 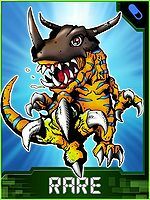 A different Greymon serving Etemon appears in "Dark Evolution! Skull Greymon". It fights Taichi's Greymon and overpowers its overeated enemy, but then Taichi causes his partner to Dark Evolve into Skull Greymon. The enemy Greymon tries to flee, but gets attacked by the runaway Skull Greymon and is killed with the technique Ground Zero. 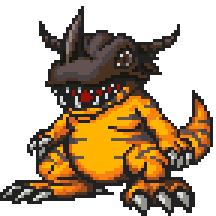 Agumon evolved to Greymon with Kabuterimon to fight Keramon on the Internet. Unfortunately, Keramon warp evolved to Infermon, when Greymon tried to evolve Infermon attacked him and as a result returned to Agumon. 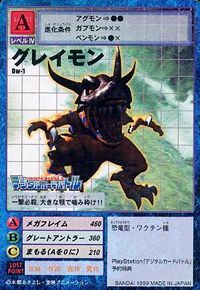 When Agumon warp evolves to War Greymon, your silhouette appears briefly. Seen at the very beginning, Taichi and Zeromaru battle against Greymon. Zeromaru defeats it, and Taichi marks it down in his record book. 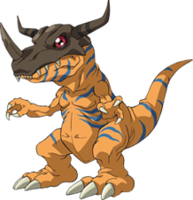 Tatsuno Tsurugi has a Greymon as his partner, which he raised from a DigiTama. It later devolved to an Agumon. 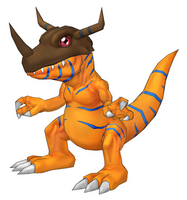 Greymon appears as an obtainable Adult-level Vaccine type Digimon in Digimon World. When the Village of Beginnings reaches a Prosperity Rating of 15 Points and the Player talks to Jijimon, a Greymon eventually comes in front of Jijimon's house, challenging the Player to a battle, and once it got defeated, it will join the Village and run the city's Arena Tournament, setting dates for specific tournaments, in where the Player can sign up to battle against other Digimon and earn rare items as prizes. 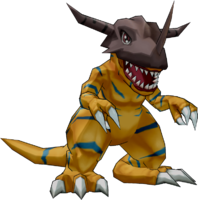 However, this Greymon is known to provide a hard battle due to its high stats and probably a higher level due to this point bing early in the Game where the Player probably has't advanced that far yet. Bonus conditions: Have a Discipline of at least 90% and know at least 35 techniques. 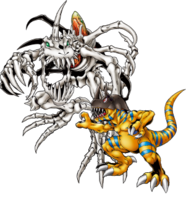 Greymon's Digivolution item is the Grey Claws which lets any Child Digimon evolve into Greymon. 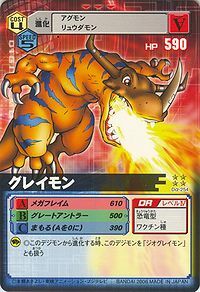 Greymon spews out a flurry of flames from its maw, burning the enemy. 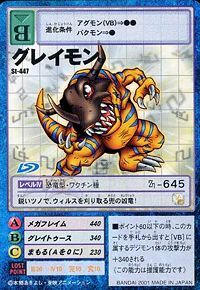 Greymon is a Adult-level and Vaccine Type Digimon. Its basic stats are: HP 160, MP 158, Attack 45, Defense 52, and Speed 38. Its Specialty is none. 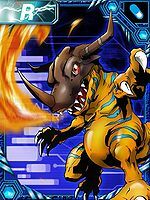 Greymon evolves from Agumon (0+ DP, EL 11) and evolves into Metal Greymon (0-5 DP, 21 EL), Master Tyranomon (6-8 DP, 21 EL) or Skull Greymon (9+ DP, 21 EL). Its skill is Mega Flame, consumes 12 MP and is a single-opponent attack. Greymon is the last opponent in Beginner City's Battle Arena after you beat A. He is an obtainable Red Card. Greymon is the Adult level of the Agumon line. It can evolve into Metal Greymon, Skull Greymon, War Greymon or Black War Greymon in battle depending on its battle points and friendship. It can also evolve to Agnimon in battle if a Spirit of Fire was used on it before the battle. 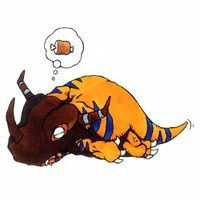 Greymon can evolve from Agumon when its energy gauge is over two-thirds full. When it is completely full, it can use Mega Flame as its attack. Can be evolved from Agumon if above level 15 and Friendship above 80%. He can evolve into Metal Greymon if above level 25 and Friendship above 80%. 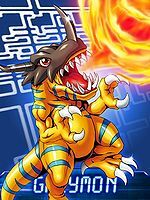 Greymon is an obtainable evolution of Agumon. 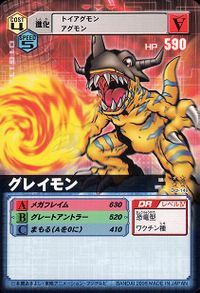 Greymon is #086 Digimon and is a Balance-class Dragon species with a resistance to the Fire element and a weakness to the Earth element. Its basic stats are 170 HP, 165 MP, 115 Attack, 92 Defense, 72 Spirit, 80 Speed, and 35 Aptitude. It possesses the Powerful 3 and Critical 2 traits. It dwells in the Task Canyon. Greymon evolves from Agumon at level 18 with 340 dragon EXP and evolves into Metal Greymon. 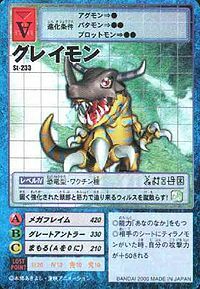 In order to evolve or degenerate to Greymon, your Digimon must be at least level 18, with 340 Dragon EXP. Greymon can jogress into DORUguremon with Garurumon, or into Skull Greymon with Devidramon. 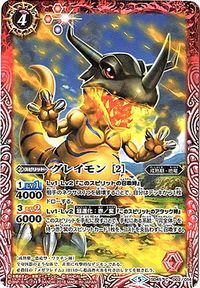 Evolves from Agumon or Agumon (Black). Can evolve to Metal Greymon (Virus), Metal Greymon (Vaccine) or Skull Greymon. Great Tooth: Inflicts 216 to 286 fire-attribute damage with 2 sec cooldown, consuming 14 DS. Obtained at level 11. Mega Flame: Inflicts 664 to 783 fire-attribute damage with 6 sec cooldown, consuming 40 DS. Obtained at level 16. Greymon evolves into Metal Greymon over 25 level, it requires x3 Evoluters in order to unlock the evolution. Greymon can be found in Western Area: East and Server Continent Desert. 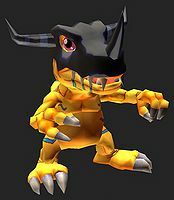 Greymon is found in North Cave. Can be evolved from Agumon if level 17 and above, revived Greymon and Friendship 50. 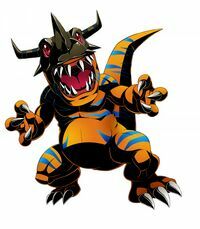 Can evolve to Metal Greymon if level 27 and above, revived Metal Greymon, defense 100 and friendship 70, or Skull Greymon if level 26 and above, revived Skull Greymon, befriended Greymon and attack 145. Its plate is the first plate you obtain as part of the storyline, and can be dropped by Koromon at Heritage Cape or Greymon at North Cave. 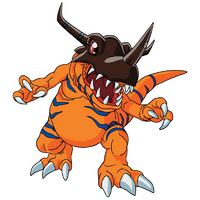 Greymon is the evolved form of Taiga's partner, Agumon. It is also an obtainable Digimon which is evolved from Agumon, Gabumon, or Pico Devimon, and can evolve to Andromon, Megadramon, or Metal Greymon. It can also be obtained as a collectible card. 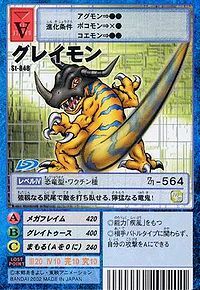 Its card is part of the Agumon Evolution (アグモン進化 Agumon Shinka) set. Evolves from Agumon. Can evolve to Metal Greymon (Virus). 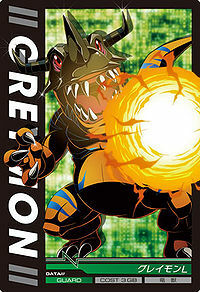 Greymon is a partner Digimon. Evolves from Agumon and can evolve to Metal Greymon. Evolves from Toy Agumon or Hagurumon. Can evolve to Metal Greymon or be Jogressed with a compatible Digimon to get Andromon or Big Mamemon. Evolves from Toy Agumon or Hagurumon. Can evolve to Metal Greymon or be Jogressed with a compatible Digimon to get Cyberdramon or Big Mamemon. Evolves from Agumon or Plotmon. Can evolve to Metal Greymon or be Jogressed with a compatible Digimon to get Asuramon or Metal Mamemon. 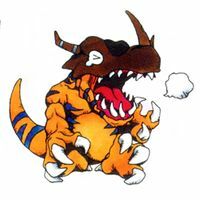 Greymon is an enemy Digimon in Area 2, Secret B and Area 4. Evolves from Agumon, V-mon or Guilmon. Can evolve Metal Greymon, Metal Tyranomon, Aero V-dramon or Megalo Growmon. Evolves from Agumon. Can evolve to Metal Greymon or Triceramon. It looks scary, but it's very intelligent! Its special attack is a super hot fireball! 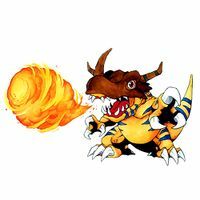 The fireball it shoots out from its fully grown body is an explosive breath of flame! With its reinforced head and its physical strength, it kicks off advancing viruses! 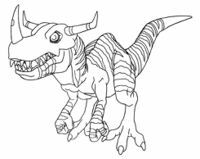 A helmeted dinosaur who harvests viruses with its sharp horn! Having braved countless battles, this flaming dragon is crowned with a helmet of courage! It uses its strong tail to strike the opponent down, a ferocious demon dragon! This ferocious, carnivorous dragon is armed with violent tendencies! It crunches with its large jaws, defeating the enemy in one hit!! A primitive individual who was still referred to as Koromon, even after evolving into Greymon! 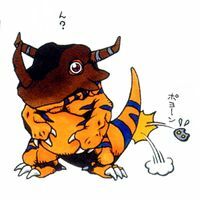 Boasting great combat ability, this Digimon possesses a sturdy body and a hard, fine horn. Its defense is also high, due to its head being covered by a hard shell. Not only that, it is equipped with intelligence, which allows it to cooperate and battle together with allies. An extremely aggressive Digimon with a body like a lethal weapon. 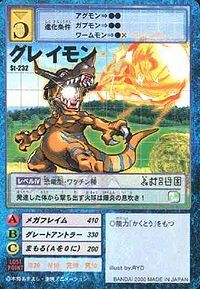 Its Special Move "Mega Flame" is spewing extremely high-temperature flames from its mouth and reducing everything to ashes. ↑ Digimon Adventure: "Explosive Evolution! Greymon!" ↑ Digimon Adventure: "Perfect Evolution! Metal Greymon"
↑ Digimon Adventure: "Dark Evolution! Skull Greymon"